T-shirt pre-order has ended, but don't worry! T-shirts will be available for purchase at the conference. Sizes will be limited. *All net proceeds from the t-shirt sales will be donated to the Dallas Martin Endowment (DME). Important: T-shirts will not be shipped to individual addresses. 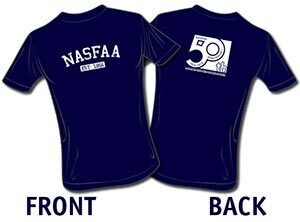 T-shirts must be picked up at the NASFAA Conference in New Orleans.